Last edited by tiesto23; 12-08-2018 at 12:28 AM. That's going to be a quite extensive repair. You've got several burnt resistors, which means something shorted. Aside from that, there's the burnt board and all the burnt traces to clean up and rebuild. Then, you'll have to find the root cause or shorted device(s). If you're not an experienced tech, I wouldn't event try it. You'll have to trace out everything on the schematic since they didn't see fit to silk screen the board with designation numbers. You're probably better off getting new board(s) or a new amp module. It's probably cheaper to just replace even for an experienced tech- lots of time and parts. Can you read schematics? If not, I don't think you will be able to fix it. You are going to have to trace out the schematic connections to fix and verify the burnt traces. It's not something that can be done without the unit, so no one here can tell you what to do without access to the burnt board. If you can read schematics, the board is the one called 440F on the schematic. It is 2 circuits that are mirror images (high and low), plus the 15V +&- supplies. So you can look at the good side to find the value of the bad side. 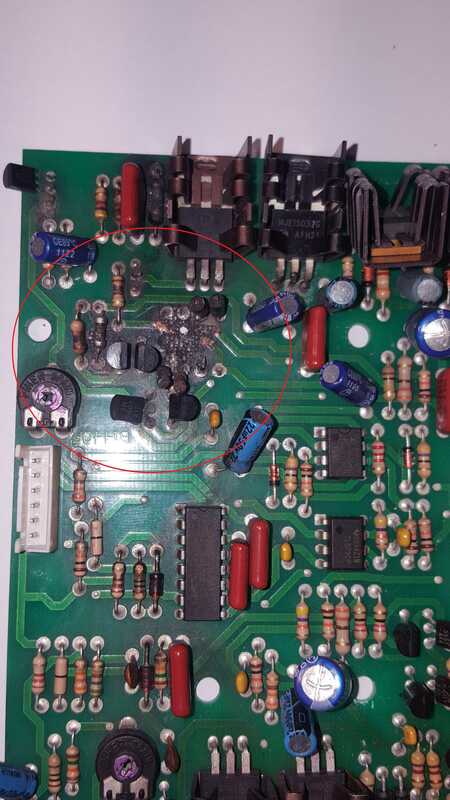 Aside from the parts you circled, there is a cap bulging and ready to burst by the ribbon connector. 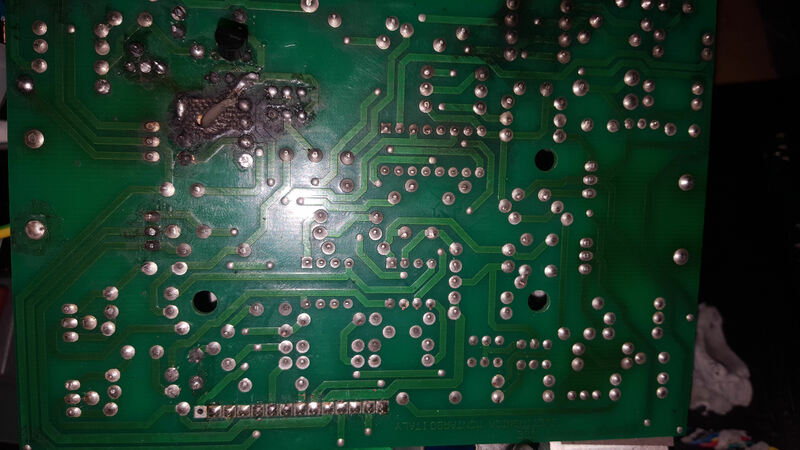 Also, on the other board you had a picture of, there is a burnt resistor. So, if you fix this board, the other board may be bad also. And if the amps are bad, the speakers could be blown too. So check the speakers before anything. Maybe same amp but not same pictures of the same section. Last edited by nosaj; 12-08-2018 at 02:55 AM. Upper right just outside the red circle is an MJE15032 transistor. It is almost certainly dead. Chances are the other similar transistors may be dead. Identify and replace at least the five small transistors in the circle. Four are in sight, the fifth went to the three solder pads near the top of the ring. Across the center of the ring, the two diodes on the right look like common types. The two resistors next to them appear to be 47 ohms. The two resistors on the left appear to be 22 ohm. Resistor next to the missing transistor, maybe 100 ohms? Top of the picture just outside the ring, a burnt resistor between the orange cap and the heat sink transistor. No idea. 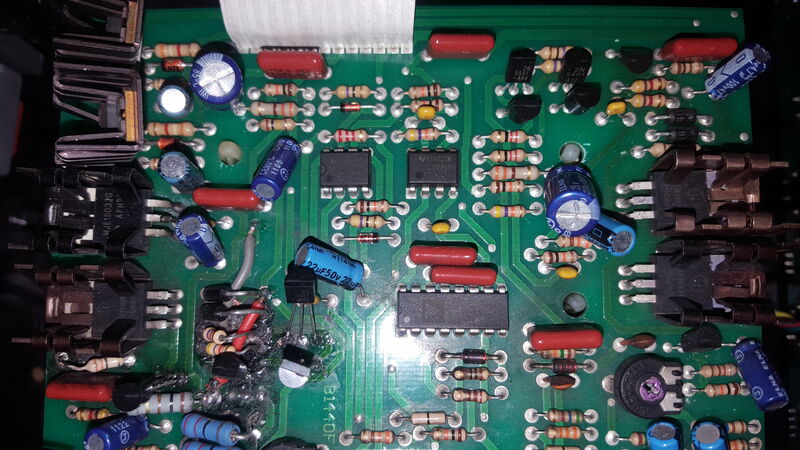 Upper left corner of board, a lonesome transistor, looks shaky to me. Frosty solder. All that damage pretty much guarantees that the heat sink transistors are damaged. And that in turn tells me the power transistors on the other board are damaged. This will not be easy even for an experienced professional. What is your level of experience for repairs tiesto23 ? It will help us with our responses to know if you are a technician or hobbyist. 1) you shouldn't have plugged it straight into Mains but used a lamp bulb limiter. Otherwise every time you turn it on "direct" you will damage more parts. 2) replacing al visibly burnt parts is not enough, sadly many damaged parts "look new" , specially semiconductors, yet are very dead ... and damage others. So please first build (and use) the bulb limiter, a 40W to 75W filament bulb is suitable for this amp. I doubt the transformer is bad: windings , specially secondaries, normally read quite low. The proper way to check a power transformer is to plug primary into mains through bulb limiter, and see what happens with all secondaries disconnected and taped for safety. 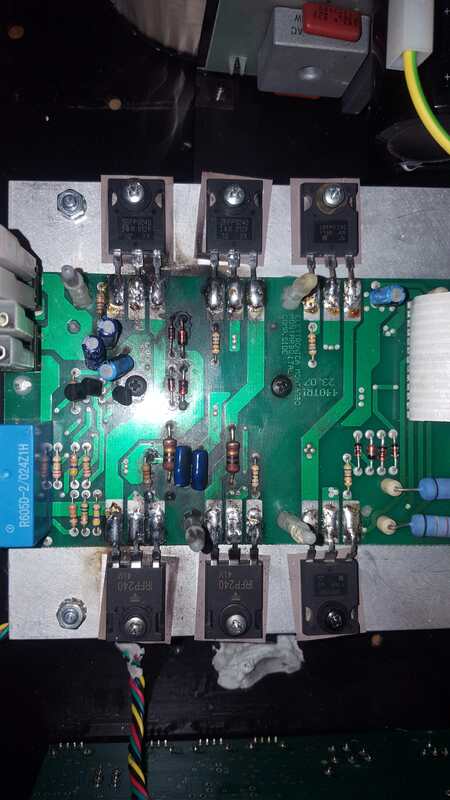 You have the main power amplifier schematic, verify board matches it, specially follow tracks from pad to pad , any missing (burnt off) track will make a mess so triple check all in the burnt area. Replace burnt parts and try amp ON again. In fact, use an even smaller 25W bulb, today we are not worried by low voltages but gross internal shorts, so let´s play it very safe. Montarbo power amps are "relatively" crude, simple designs ... which in this case is good. Still no speaker or any load attached . 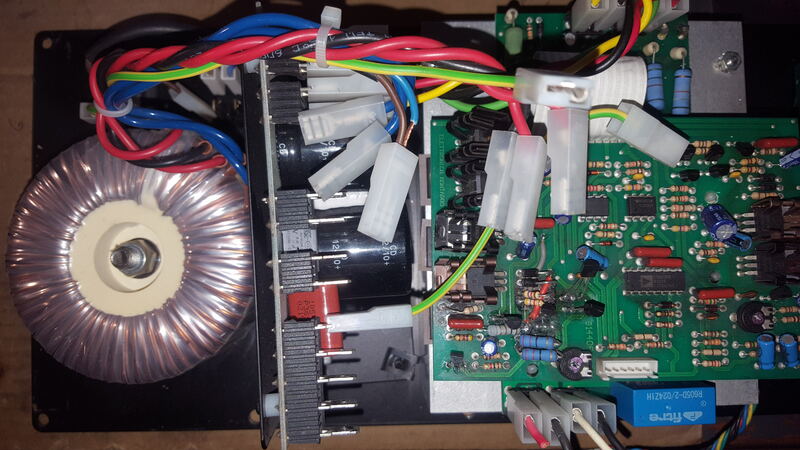 Ok, if you have a dead power amp and a dead transformer then you have nothing, not worth repairing it because it will cost more than buying a new one, and you have zero guarantee it will work anyway..
b) remove all electronics , on the remaining backplate install 2 speakons and a suitable crossover. Drive it from any powered mixer or rackpower amp you have available. VERY popular here in Argentina, I see it all the time. c) get a plate amp which fits the current backplate or cut an aluminum rectangle, say 2 or 2.5 mm thick, of exact size to fit hole left by original Montarbo power unit, and mount yopur new power amp and supply there. A Class D amplifier + SMPS supply will be lighter and cooler than the original Montarbo . I rebuild lots of these amps. Unfortunately the damage on this board is extensive. I haven't seen one with so much damage. Well, since you already fixed the amplifier, which is the hard part, now getting a replacement transformer is not such a big deal. If you find one same specs, perfect. If you find one with somewhat less voltage, no big deal. Say original one used 60V rails and the one you found (at low cost or pulled from a dead amplifier) gives you 55 or 50V rails ... when "measured" you´ll find less power output but when in actual use ... you won´t *hear* that much difference ... if at all. Not sure if you are repairing "just one" or you are a Tech with a continuous work flow; if so, you probably have your own "junkyard" with a couple dead amplifiers or powered mixers ... you can often reuse a power transformer pulled from these. 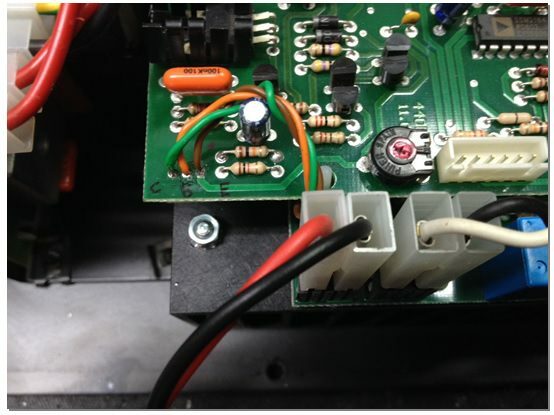 Please post a couple pictures showing the full plate amplifier innards, I´m specially interested in how are power MosFets attached to heat sink. I always see the grey ribbon cable connecting PCB to them but nobody ever shows them. It will also be useful to see how/where is the current power transformer mounted and what free space you need for a new one. If you post core size measurements, I can estimate VA rating. The few I have seen (in smaller Montarbo cabinets) were conventional EI type, not sure about yours: is it EI type or a Toroid? Does it have any labels on it? Interesting: a sandwich/stacked board construcion to save space: one board carrying the MosFets and right against the heatsink, plus the driver/processor board "floating" over it, maybe 10/12mm - 1/2" above it on computer board type stacking insulators. The grey flat ribbon cable here helps servicing, you can "open the sandwich" and look/work inside without much trouble and with amp still working, not a bad idea at all. Last edited by J M Fahey; 12-15-2018 at 01:05 AM. 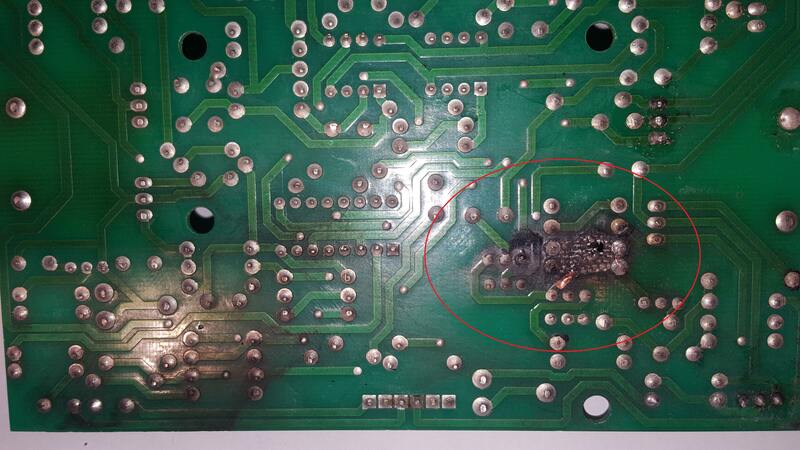 You should/should have cleaned up and removed all of that burnt circuit board. It can become conductive when it burns. What the Dude says is that besides any "chemical" cleaning, you must scratch/sand/dremel out all carbon residue from tje board, because carbon is conductive and cause new shorts. In extreme cases where carbon goes all the way through the board to the other face, Techs have cut through and discarded a rectangular "window" in the PCB and replaced missing tracks with rigid wires "floating in the air". Yours is not *that* bad, but I mention this so you know CARBON IS YOUR ENEMY.